Ahmed Osman is a Muslim Egyptian writer living in London, who published a series of books since the late 1980s and early 1990s in which he argues that Yuya, the father-in-law of pharaoh Amenhotep III and grandfather of Akhnaton, who was the only commoner buried in the Valley of the Kings, was actually the Biblical patriarch Joseph. From this basis, he proceeds to identify Akhnaton with Moses (largely because no texts record his fate and his mummy has not been found) and his son and successor, Tut‘ankhamun, with Joshua ben Nun and with Jesus of Nazareth for reasons that are not at all clear. Like so many Bad Archaeologists, his primary source material is textual: the Hebrew and Christian Bibles, the Qur‘an and ancient texts. He appears to be driven by a desire to demonstrate that the true religion of Ancient Egypt from the time Amenhotep III onwards was the monotheistic source of modern Judaism, Christianity and (most importantly for Osman, one supsects) Islam. He contends that the Hebrew Bible does not record the history of the Jewish peoples of Judaea but is instead a distorted version of Egyptian history. The monotheistic religion of Akhnaton was kept alive by Essenes – whom he recasts as the original Christians – who secretly followed the teachings of Joshua/Jesus after his murder. They were forced into public view after their prophet John the Baptist was executed in the first century CE. Needless to say, this form of analysing the past – assuming that one historical character is recorded in different sources under another name – opens up all sorts of strange hypotheses. While Osman’s starting point, the evidently foreign origins of Yuya, is valid enough, considerable straining of sources is necessary to encompass the remainder of his hypothesis. If his (and Immanuel Velikovsky’s) account is almost entirely based on textual evidence, they are both bad historians and not bad archaeologists. History requires textual evidence. I haven’t read Osman, but as far as I can see even his textual evidence is pretty much non-existent, and archaeological evidence he has none. The belief that Velikovsky’s chronological reconstruction is text-based seems to stem from repeated assertions by people who have never read the rest of the Ages in Chaos series which have whole chapters devoted to archaeology. To see the difference between Velikovsky and Osman here are some predictions that flow from the dating of the Exodus to the end of the 13th dynasty, and updates on how they have fared archaeologically since the writing of Ages in Chaos. 1. There should be a significant presence of people from Syria-Palestine in Egypt. Since then a Syro-Palestinian city at Pi-Rameses/Avaris has been excavated, and it’s in the right place and at the right time. 3. The person of Potiphar was identified by V and found to live in the time of Amenhemet III, and probably his successor http://www.varchive.org/ce/joseph.htm If the identification is correct then one might expect the major influx of people from Syria-Palestine to have happened during the reigns of these kings. When Avaris was excavated this was indeed found to be the case. http://www.auaris.at/html/history_en.html The likelihood of these three all turning out to be true purely by coincidence can be given to a good first approximation. It’s zero. I have found the writings of Ahmed Osman brilliant. I have not yet found an explanation of ‘Monotheism’. There are many religions expressing different versions. Was the Aten the Light of Trismegistus Hermes? That would perhaps fit with the date of Akhenaten. As Jesus came later being the ‘Light of the World’ and the Enlightenment of the Buddha. When Ahmed Osman says that Akhenaten and Moses were “one and the same person” he’s saying that a real human being, Akhenaten, is one and the same person as a fictitious allegorical character, Moses. What he is implying is that Akhenaten was discovered in a basket in the Nile, later sojourned in Midian before returning to the Egyptian Delta where he organized a revolt of over half a million Hebrew (not Israelite) slaves and led them, ever so slowly across the Sinai peninsula (it took Moses 40 years to go just 700 miles), and then go up into Canaan before turning over the leadership to Joshua ben Nun. Just how Akhenaten would have been able to take time out of his busy schedule at Akhetaten and do this is not explained. Neither does he explain how Moses–in addition to all the above–was crowned as Pharaoh, marry Nefertiti, have six daughters, build a new capital for Egypt, and handle all the international correspondence known as the Amarna Letters. Now it is perfectly true that no one knows where Akhenaten’s body is and it is also perfectly true that no one knows where Moses is buried. In the first instance, Akhenaten’s body may have been destroyed by the vandals that wrecked Akhetaten, Akhenaten’s new capital city and in the second instance, Moses body probably will never be found because he never existed. But, one might ask, just what does that prove, if anything? You clearly haven’t read Osman’s work. He doesn’t anywhere claim that Akhenaten was found in a basket in the Nile, rather he draws attention to the similarity of the Moses story and that of the Sumerian Gilgamesh tale. He also points out that the story of Joshua in the OT was a fictionalised event to cover the fact that Tutankhamen (Joshua) had been killed by Israelites. And who told you that Amarna was ever the capital of Egypt? A note of caution: never believe everything that Egyptologists feed you. As for proof, it is there but difficult to present because for decades certain people in Egypty have striven to erase it. Nonetheless, the truth will out one day. I guarantee it. I have read Osman’s work and found it confusing! Akhnaten’s body was never found? Hasn’t DNA testing on Tutankhamun found that the mummy of his father had been cached in the tomb of Amenhotep III, and this mummy is assumed to be Akhnaten? 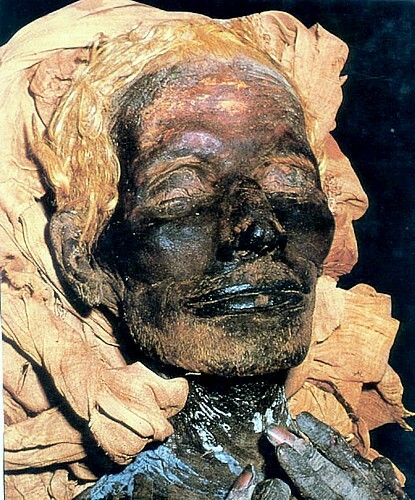 Yes, the mummy in KV 55 is the father of Tut‘ankhamun; it is only an hypothesis that makes this Akhnaten, though. It might equally be the problematical Smenkhkare‘ or an otherwise unknown son of Amenhotep III. The mummy in KV 55 not KV 54… I too have read Osman and found much of his material, especially his re-construct of the chronology in the Moses book, to be very thorough and difficult to debate (which has really not happened interestingly enough). Instead…I am seeing general comments about him and his conclusions. Interesting. Thanks for the correction. I’ve updated my comment – written too hastily, as usual! – to remove the error. Last, it is Akhenaten not Akhnaten per your comment, assuming this was a typo. Why does the father in KV55 have to be a son of Amenhotep III? I am not saying it is not, in fact my guess based on what we know so far is that it is likely Smenkhkare’s son. There are many different ways of inserting vowels into Egyptian names. Akhnaten is as valid as Akhenaten; you will also no doubt have seen Akhenaton and there is also the more pedantic spelling Ikhnaton. The DNA of the mummy in KV 55 shows that the most plausible father is the mummy identified as Amenhotep III; the same DNA shows that he was also the father of Tutankhamun. The big question is the identity of the mummy: is it Akhnaten or Smenkhkare? Or was Smenkhkare the throne name of Nefertiti? If we accept the hypothesis that they are one and the same, then either KV 55 is Akhnaten or it is an otherwise unrecorded brother. The burial in tomb KV55 has been identified using DNA — with the JAMA study — as being the father of Tutankhamen. This tomb was not that of Amenhotep III. The body in question has been identifed as most likely being that of King Smenkhkare because pathological testing has repeatedly shown the deceased was too young at death to have been Akhenaten. It’s true that Zahi Hawass does use every opportunity to deny this and to insist instead that it really is Akhenaten, but he has his own dubious reasons for doing this. Even when science goes against them, some myths continue to obscure the truth. The KV55 burial is fascinating and not yet properly explained. While the body is that of Tutankhamun’s father beyond any doubt, the identity of the body remains unclear. From what I understand, the age at death of the mummy is still disputed, with one side opting for 20-25 years and the other for over 35 years (which I understand is based on tooth wear). The DNA evidence shows that KV55 was not the maternal grandfather of the two foetuses in Tutankhamun’s tomb; Tutankhamun is the father and mummy KV21 is the mother. Smenkhkare remains a possible identification; so, too, does Akhnaten, if the foetuses are the children of a secondary wife rather than Ankhesenamun. I feel that this story will rumble on for years. Facial reconstructions indicate that neither the Amenhotep III mummy, or the KV55 mummy belong to Akhenaten. The KV55 mummy looks like Smenkhere, while the Am III mummy looks like Am III. The mummies of Akhenaten, Queen Tiye and Nefertiti have yet to be discovered. More Amarna mummies or burials may be found in hidden chambers behind Tutankhamun’s tomb. The relationships are a minefield. The DNA shows us how different sets of remains are related, but don’t give us the identity of the person in tomb KV55. At the moment, most Egyptologists seem happy to regard the person as Akhenaten (I think they’re wrong). I thought that the DNA analysis indicated that the ‘Elder Lady’ had been positively identified as Tutankhamun’s paternal grandmother and matched DNA from the lock of hair in his tomb that was labelled as belonging to Tiye.